China has lifted a law which banned foreigners who have HIV and Aids from entering the country. The newly-amended law, published on the government website, comes ahead of the opening of the Shanghai World Expo on Saturday, which expects 100m visitors. WHO welcomed the decision, calling it "a significant step in the right direction". More than 50 countries around the world still have laws and restrictions for HIV-positive people. Dr Margaret Chan, WHO Director-General, said: "This decision should inspire other nations to change laws and policies that continue to discriminate against people living with HIV. "Many policies that discriminate against people living with HIV were enacted at a time when AIDS was surrounded by widespread fear and hopelessness. "With HIV prevention and treatment now saving millions of lives, this is no longer the case. Policies that help curb discrimination can help prevent further transmission," she said. The International HIV/AIDS Alliance welcomed Tuesday's lifting of the ban, describing it as "progressive". 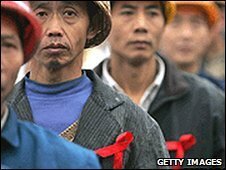 Graham Smith, the group's China director, told the BBC World Service the move could help bring an end to the stigmatising of people with HIV and Aids. "I think the value of a policy like this being lifted is the fact it sends out a very clear message that discrimination against people with HIV/Aids is not an effective way to control an epidemic and is a real barrier to prevention," he said. In a statement, UN Secretary-General Ban Ki-moon said "punitive policies and practices only hamper the global AIDS response". "I urge all other countries with such restrictions to remove them as a matter of priority and urgency," he said.